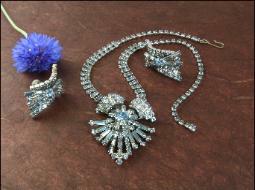 ornament - 2"L x 1 3/4"W. Necklace - 15 1/2" end to end. Screw back earrings - 1 1/2"L x 3/4"W. .
extension can easily be removed if so desired. 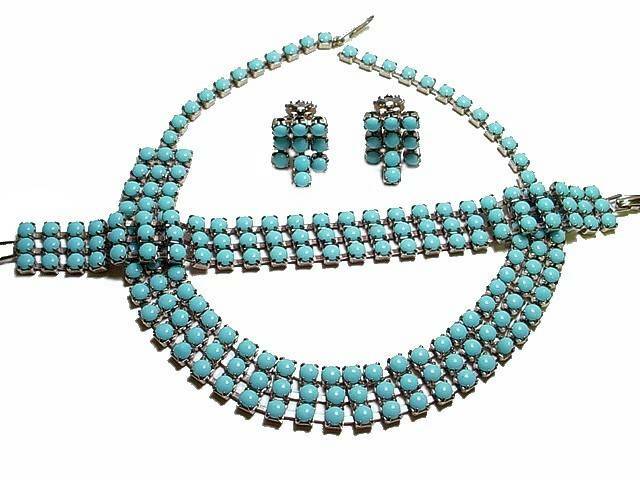 Demi parure vintage necklace set, light teal blue. 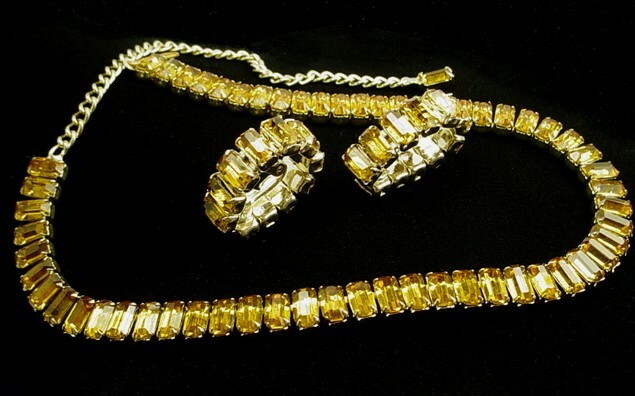 Choker necklace 3 rows in front and 1/2" wide, necklace length - 13 1/4"
(length includes the j clasp). Bracelet - 6 1/2" total length x 1/2" wide. Clip earrings - 1". length. At one time they had cushion pads added to the earrings that left a little residue, the pads could easily be replace. 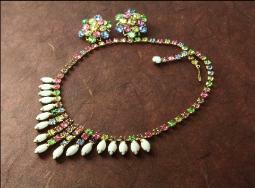 Vintage prong-set milk glass and pastel rhinestone fringe necklace and matching earrings. Very unusual color combinations like Hollycraft or Weiss but unsigned. Center fringe - 1 3/8" at front. Earrings - 1 1/8" diameter. 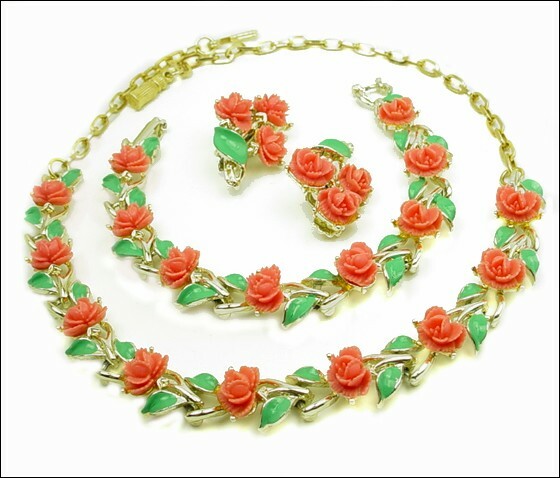 Necklace choker - 14 1/2"L. Circa 1950s. colors, 16" long. 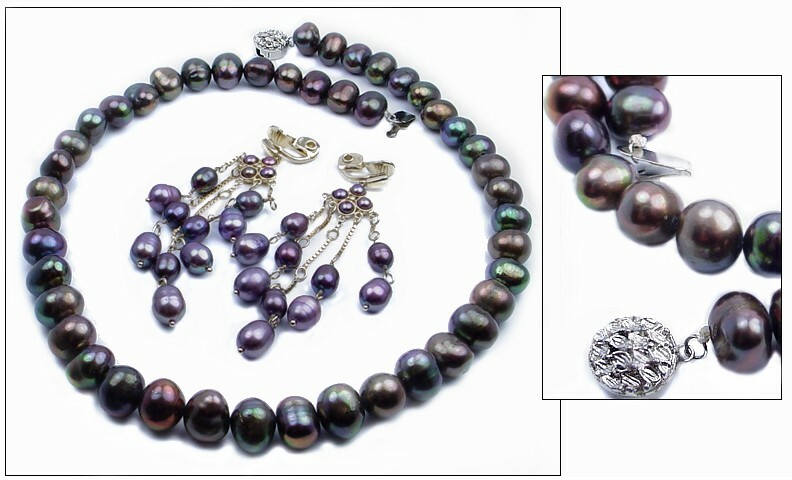 Complimentary multi strand pearl clip earrings - not an exact match, goldtone, dangles 2 7/8" long. enamel leaves. Necklace - 16"L. J hook clasp. 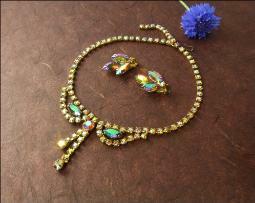 Bracelet - 7" plus the fold over clasp. Green bubble babble glass alternates with claw set peridot rounds, matching clip earrings. 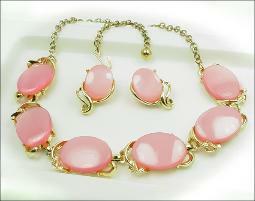 Necklace choker - 14 1/2"L. Clip earrings - 1 1/4"L.
Pink thermoset necklace and earrings in a modern gold tone set. Clip earrings - 1". 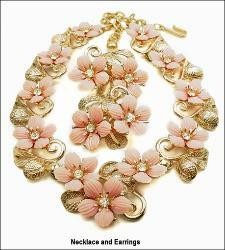 Necklace - 16"L.
leaves surrounding the florals. 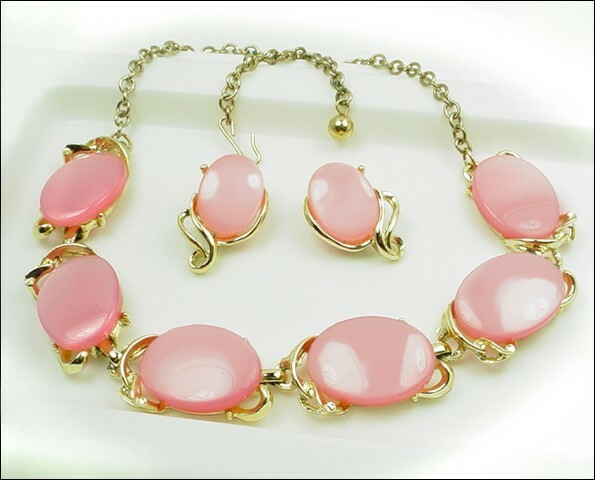 Earrings - 1 1/2"L. Necklace - 14 1/2". J hook clasp. earrings - loops wrap around the ear, 1"L x 3/8"W. Necklace - 16" does not include the 1/2" J hook clasp length. wedding jewelry needs. 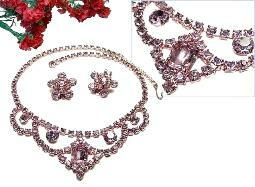 Baguette Set, Bubble Glass Set, capacious RS Set. 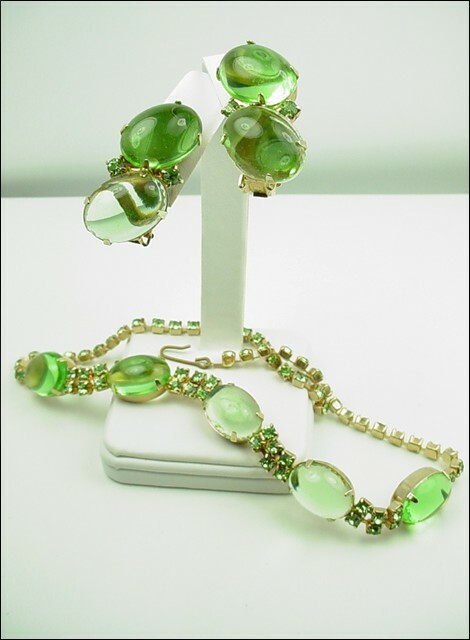 Add a dramatic flair to your next formal outfit by accessorizing with a green bubble babble necklace and earring set!